What Brings the Fragrance of Spring? Strolling through a field of fragrant blooms will immediately remind you of the untroubled days of your childhood and arouse your enthusiasm for spring and life. This magical feeling can be brought to your home through our handmade acrylic paintings, which, with their attractive flower motifs, will equally enchant your hotel guests. Surrounded by lush green grass, poppies, cherry blossoms or clover leaves unfold and proudly present their natural beauty. Petals sway gently in the mildly warm wind which spreads the flowers’ alluring fragrance all around. An oasis signifying perfection and completeness can be found in these floral paintings - even your feet seem to be tickled by young grass and your skin warmed up by the afternoon sun. Yes, flowers let you know that life is beautiful. Special paintings that focus on a nature motif will bring a wave of life to your rooms in the same way that the first flowers of spring will transform a desolate winter landscape. This is true inner beauty that originates from nature’s vitality. With your fine taste and artistic sense, you can create a wonderful indoor landscape through elegant acrylic paintings with tiny blossoms or an XXL oil painting depicting beautiful petals and buds. The true masterpieces are composed of a skillful blend of bright colours. These paintings also suggest a certain lightness and a sense of security, thus creating a pleasant and unique atmosphere. An elegant and lively painting on the wall that brings traces of life and a glowing field of flowers to the living room will certainly catch the viewer’s attention. Flowers depicted in bright multi colours will generate a stimulating energy and, above all, inspire you at work or in the kitchen. in our excellent painting series will become the highlight of your modern living and working spaces. Vibrant, colourful tones suggest harmony and diversity, while lighter colours with delicate accents have the charm of a small and well-kept cottage. Either way, an acrylic painting will make your bedroom a much more delightful space. A portrayal of nature’s beauty will make the flower in our hearts bloom in love! Spruce up your living space with tasteful paintings of flowers. Joy, love and beauty are all associated with flowers. 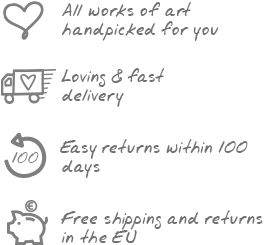 You can prove your excellent taste and appreciation for the finer things in life with a handmade acrylic painting. Let the walls of your hotel blossom with beautiful art.